You'd think, when it came to driving dynamics, that this A5 would be starting out with a disadvantage over 4 Series Coupe rival. Its front-driven layout will, after all, never reward an enthusiast in quite the same way as a rear-driven BMW. But in originally developing this car, Audi was convinced that it could be made to feel almost as good. To prove the point, three different suspension systems are being offered this time round, two of them passive and one featuring adaptive damping. 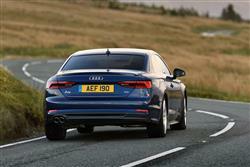 Whatever your choice, you'll find the set-up firmer than it would be in an equivalent A4 saloon. Under the bonnet, the engines pretty much reflect the ones you get in the A4 line-up, with the exception of the fact that you can't get the 150PS 2.0 TDI motor. For petrol people, things kick off with the brand's 1.4 TFSI powerplant, provided in 150PS guise with 2WD in the base '35 TFSI' variant and offered with 7-speed S tronic auto transmission. There's also a 2.0 TFSI petrol engine in the '40 TFSI' model, offered with a manual or an S tronic auto gearbox. 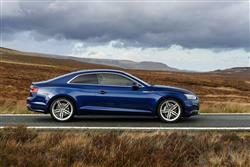 And a 245PS version of his same 2.0 TFSI unit available solely with S tronic and quattro 4WD. 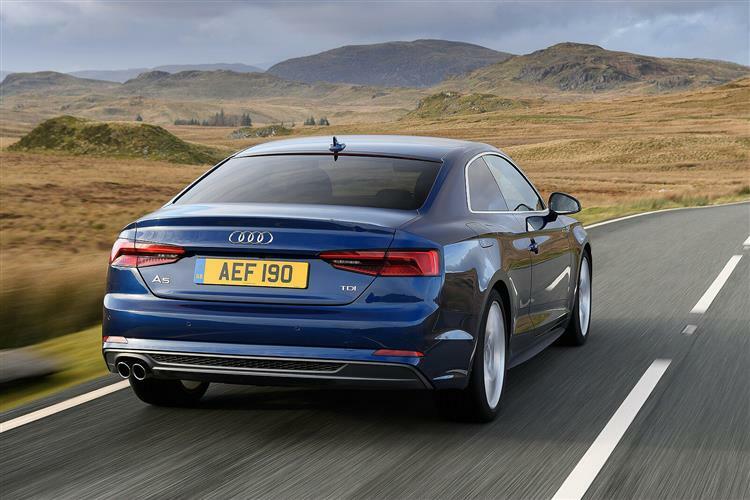 If, like many A5 Coupe buyers, you want a diesel, you'll probably want the 2.0 TDI 190PS unit, offered with either a manual or an S tronic auto 'box in the '40 TDI' derivative, plus if you go for the auto, there's a quattro option if you want it. If you need a diesel with more poke, there's a 286PS six cylinder 3.0 TDI '50 TDI' derivative, which only comes in quattro guise with S tronic transmission. 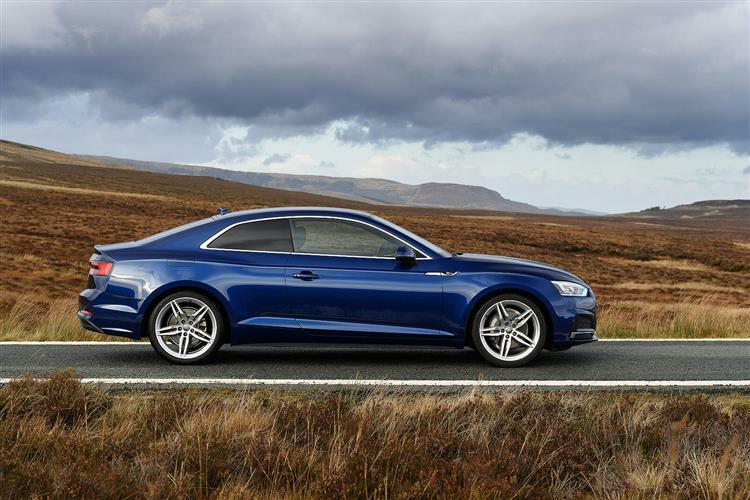 At the top of the range, the sporting S5 quattro variant gets a 3.0 TFSI turbo V6 powerplant with 354PS. 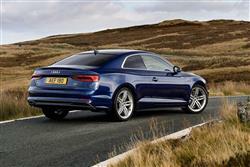 The flagship RS5 quattro gets its own 2.9-litre V6 with 450PS on tap. 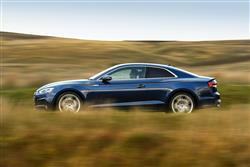 In the mainstream A5 Coupe range, there are four trim levels - 'Sport', 'S line', 'Black Edition' and top 'Vorsprung'. Prices start at around £34,000 and rise up to just under £55,000. 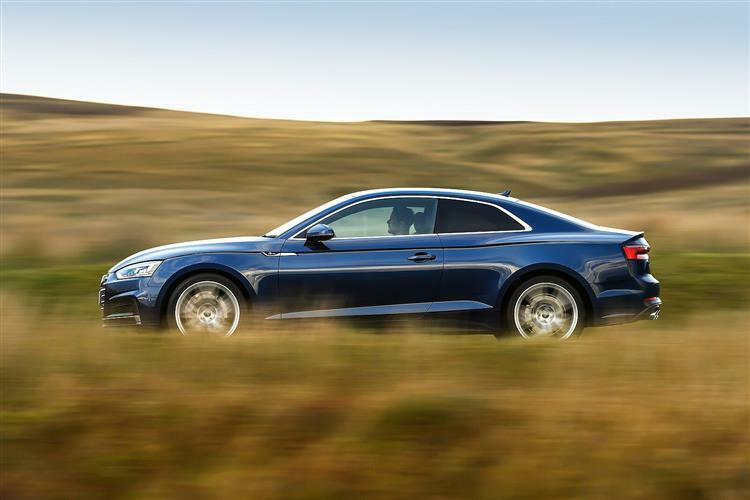 You'll need a £49,000 budget if you want the 354PS S5 flagship model and around £64,000 for the top RS5. As usual, there's a premium of around £3,500 to pay if you want to switch from any given petrol variant to its diesel alternative. If you want S tronic automatic transmission on the base petrol and diesel variants most will choose, there'll be a premium of around £1,500 more to find for it. Go for the diesel auto and you'll be offered the further option of finding around £1,700 more to get quattro 4WD. Whichever variant you choose, you should find your car to be decently equipped. 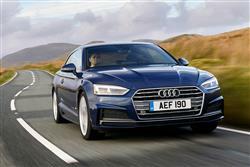 Among the features included are xenon headlights with LED daytime running lights and LED rear lights, LED interior lights, the Audi 'MMI radio plus' with a 7-inch MMI colour display, Bluetooth, a USB charging function, a three-spoke multifunction steering wheel, the Audi drive select dynamic handling system and Audi 'pre sense city' autonomous braking. Audi is particularly proud of its media connectivity, specifically the 'connect' system that can link to the Internet via the ultrafast LTE network.With the standard Audi smartphone interface, Apple Car Play and Android Auto bring the familiar smartphone environment to the car, if desired. The optional Audi phone box with wireless charging in the centre armrest uses near-field coupling to link smartphones wirelessly to the vehicle's antenna. The 60kg weight saving achieved with this MK2 model plays a big part in the claimed 22% efficiency savings achieved this time round, despite the increases in power delivered beneath the bonnet. In fact, the body is the lightest in the competitive field thanks to an intelligent mix of materials and lightweight design. 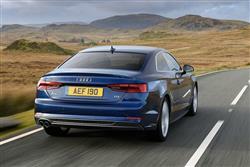 It also helps that with a drag coefficient of 0.25, the A5 Coupe is the segment leader with respect to aerodynamics. What about the figures (calculated on the WLTP cycle but converted back to NEDC). A base '35 TFSI' petrol version manages up 47.9mpg on the combined cycle and up to 133g/km of CO2. A diesel '40 TDI' front-driven variant is able to deliver up to 62.8mpg on the combined cycle and 117g/km of CO2. Of course, the driver will have to do his or her part. Helping here is the clever 'Predictive efficiency assist' system that could potentially improve your fuel economy by as much as 10%. It works with the Navigation package and analyses any given route, once set, to decide how the journey could be undertaken more efficiently, taking into account things like the speed limits, traffic signs, bends and roundabouts you'll be encountering along the way. The set-up then offers driving tips that'll help you achieve that: perhaps, for example, a junction is out of your sight around the next bend and you could take your foot off the accelerator a little earlier. Get onto the motorway and with the optional Adaptive Cruise Control system activated, 'Predictive efficiency assist' will automatically make all the frugal driving adjustments for you. 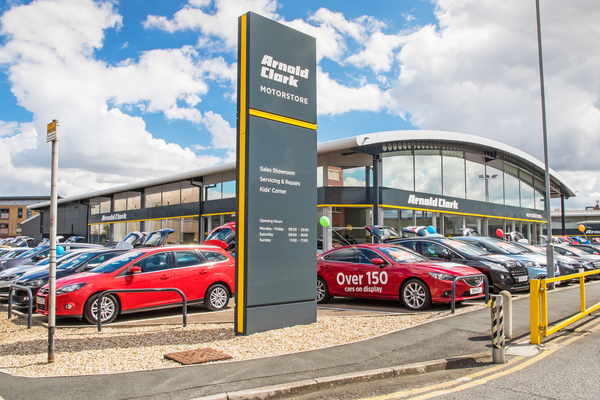 If it knows you're going to be travelling for a few junctions, it'll even disengage the engine at cruising speeds for greater efficiency, then re-engage it immediately and almost seamlessly when you either accelerate or brake.